It is raining heavily here in Ahmedabad since two days now and I am enjoying it with a cup of hot coffee.. Let me know how you enjoy rainy times ? Today it's the nailart tutorial day... 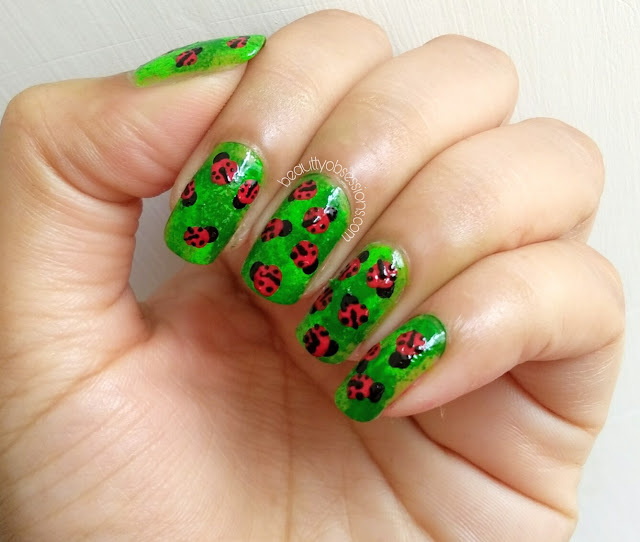 I will share a super easy nailart tutorial which is best for monsoon... As we all know, monsoon means greenery everywhere.. right? 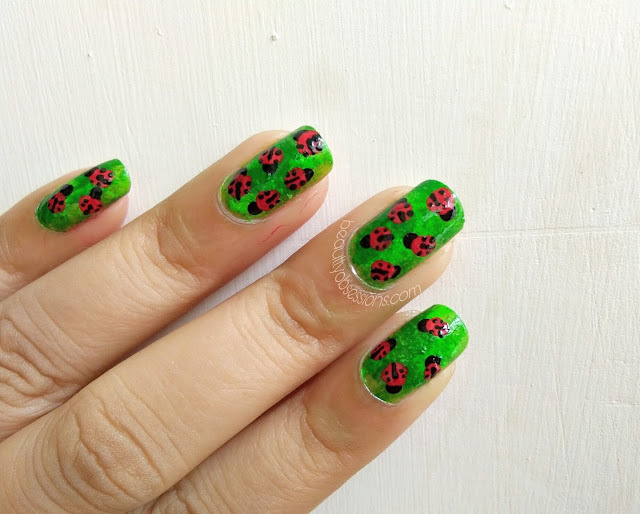 During this season you can notice one kind of beautiful insect on green grasses which we called Ladybug but now it is very rare to find ladybug in cities.. 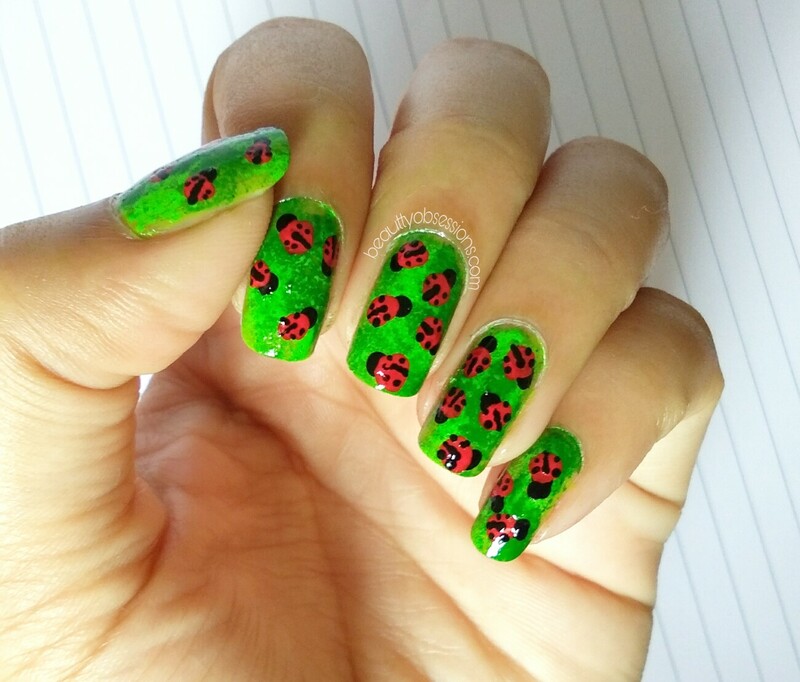 So today I tried to bring the cute insect ladybug on to my nails... Yes.. 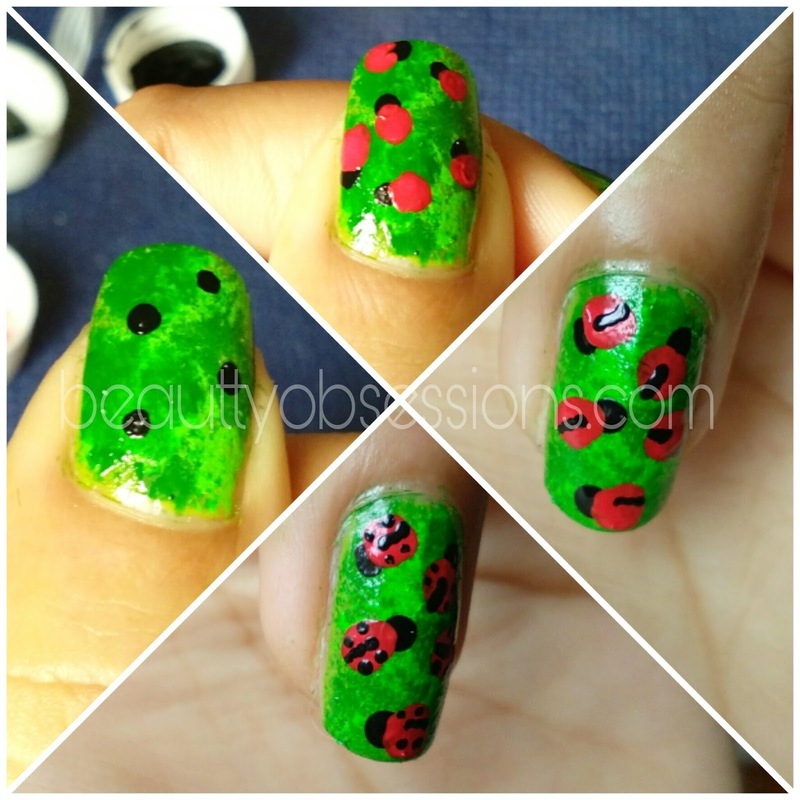 It is a ladybug nailart tutorial.. 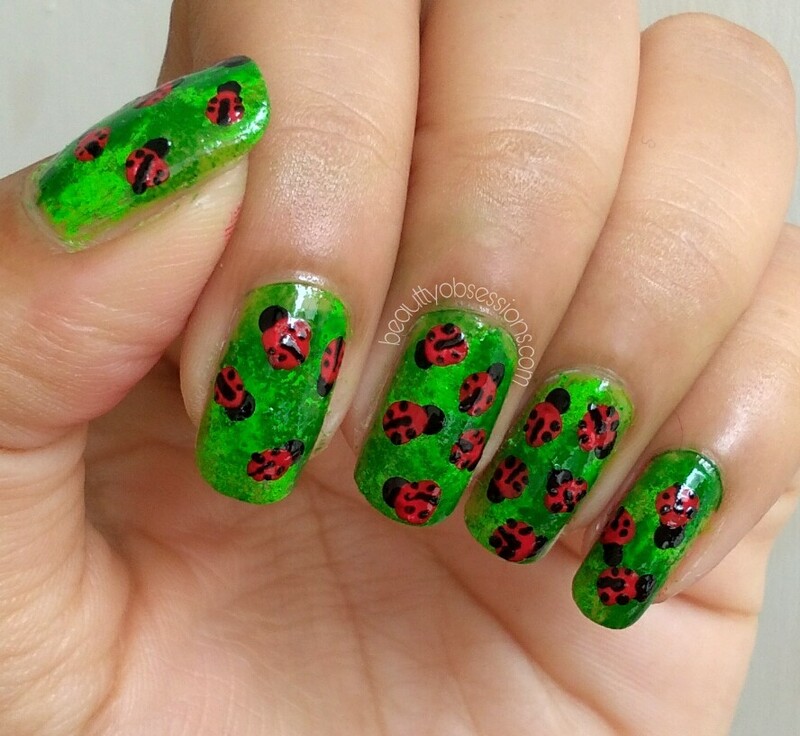 I tried to create the resolution of grass and ladybugs on it randomly.. 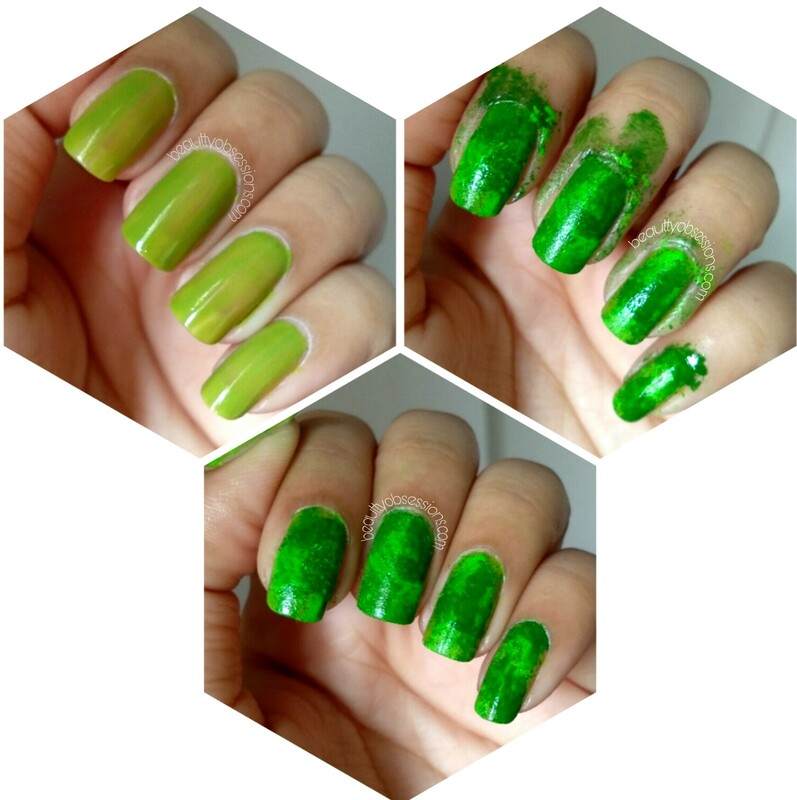 The steps are really simple and easy to draw... Let's get into the tutorial..
1- Three different shades of green nail polish, you can use acrylic colours too but the base colour must be a green nail polish . 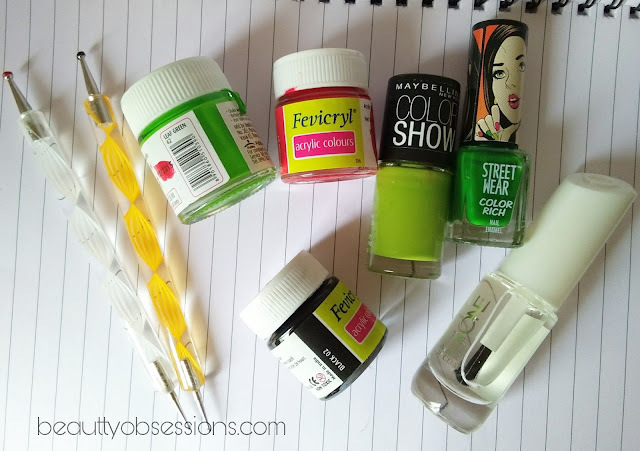 1- First apply the clear base coat to protect nails and then apply the lighter green shade nail polish which I have used as base colour. 2- Now take the darker green and other green shade through a sponge and dab randomly just to create the resemblance of green grass. 4- For creating ladybug, first put few random medium size black dots..
6- Then through the smaller pointed dotting tool draw a black line at the middle of the red dot and four dots on the both sides of the black partition.. (hope you are getting me what I am saying, I am very poor in explaining things). 7- Now wait to dry everything and apply the top coat to get a shiny finish look..
Hope you liked this tutorial... Do share your thought below in comments..
OMG! 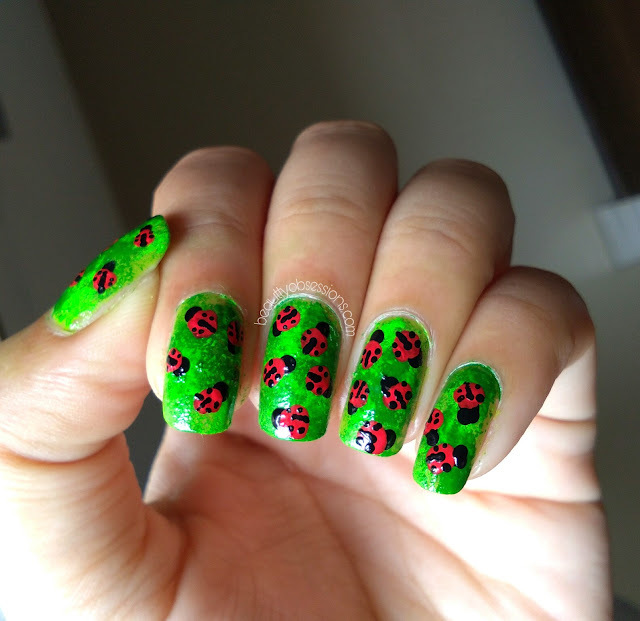 how I love this Nail Art. It is super gorgeous and classy. The Lady bugs are so cute. I showed to my daughter and now she is behind me to make this. Honestly my hand is not that good in Nail art but still will try.